I’ve been accused sometimes of belonging to the group of young Italian cowards who have left Italy to find an easy way-out abroad. I’d skip all the fluff about the fact that moving from Italy to another country is not easy, and finding a good life-work balance and setting yourself up – as my grandma used to say – is far from being a child play. I want to tell you a story about an email I received this morning. That’s the paradigmatic example why Italy “deserves” the massive brain drain happening in my native country. A friend of mine, S., got her MD in a scientific discipline with top grades. She got her degree in a quite renowned Italian university which I call university of Tursenia for privacy reasons. I’ve deleted all the sensible bits of the email for obvious reasons, but it still looks pretty clear, isn’t it? I know this professor is not a native English speaker, but what he wrote not only is it poor in grammar and syntax, but also lacks in terms of content – the letter is so generic that could be applied to somebody after a position in a bank, or as a fruit picker in a farm, or for being the Apple Inc’s CTO. I don’t see anything specific who can make S. stand out as a professional in her technical area and therefore be chosen for a PhD. 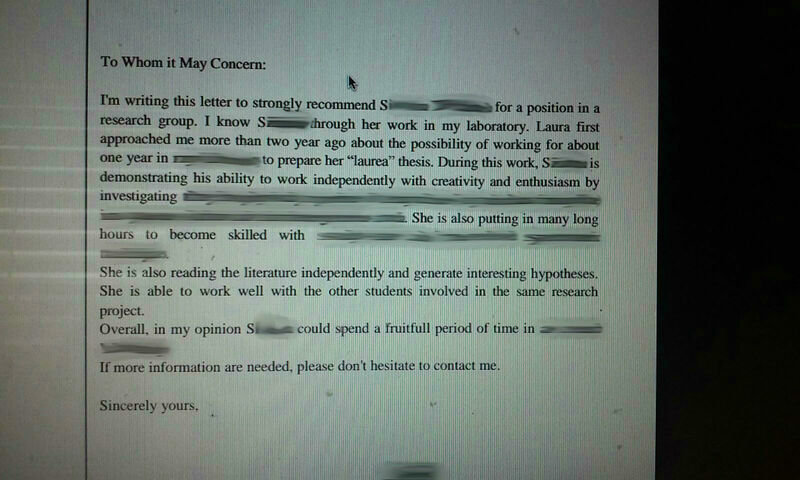 The most serious thing, though, is on the second line of the email; the professor quotes our friend S. by calling her “Laura”. WTF? He didn’t bother less on writing a decent recommendation letter for S.
He can’t care less about people abroad making (bad) ideas about him and the whole department and university he’s representing in that email. How many chances has my friend S., given that her CV is equal to her contenders, to be picked by presenting this recommendation letter? If the eyes are the mirror to the soul, is this email the mirror to the Italian education system? Can people like me, who have sacrificed many things and bet everything on our adventure abroad, be guilty of having left Italy to build a successful career and a serene life in another country? Can I show this email to my mother the next time she asks me if one day my husband and I will come back home to live in prosperity in her neighbourhood? I’m waiting for your suggestions. Far be it from me to make generalisations about Italian universities: my sister currently works for the Perugia University and cooperates with high skilled professionals, so she can’t complain at all. Anyway, the next time somebody called me as a traitor (LOL) and I want to reply back (not that I’m normally up to that, I really don’t care), I’ll have this email to play as a jolly. To my friend S., who’s probably reading this: luckily this email is not the only thing you’ve got in your brilliant skill set. Use this letter as a motivational; this is why you’ve chosen to go abroad for your PhD rather than staying in Italy and dealing with people like the author of your recommendation email.